Airplay lets you wirelessly show off your iPad photos on TV. However you can do more than just playing still photos. You can view your photos on TV with music, transitions and other effects, which will attract people’s attention and interest. 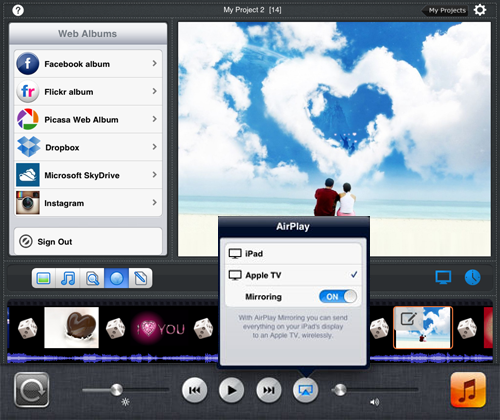 You can take advantage of Photo Slideshow Director HD‘s airplay feature to stream your photos from iPad to TV in slideshow. 1. Before streaming photos to TV from iPad , you can use Photo Slideshow Director HD to turn your photos into a slideshow first. Import your photos to the app from iPad Photo Library, add songs as background music, apply dynamic transitions, customize the pan&zoom effects, sync slideshow to music, set slides and transitions time, and etc. 2. Set iPad and Apple TV in the same Wi-Fi network. 3. Double press your iPad home button, then you can see all the apps you are running at the bottom of your iPad screen. Swipe the app-switching tray from left to right till you see a volume slider and the AirPlay icon. 4. Touch Airplay icon and check “Apple TV” and toggle the Mirroring switch to On. 5. 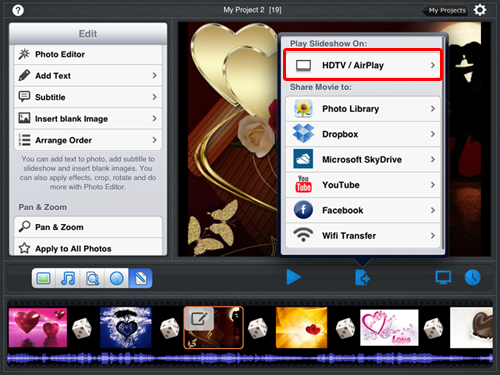 Go back to Photo Slideshow Director HD screen, touch “Export” and choose HDTV / AirPlay. 6. Finally, touch Play icon to play the photo slideshow. Touch the Full Screen icon to watch your photos on TV in full screen. 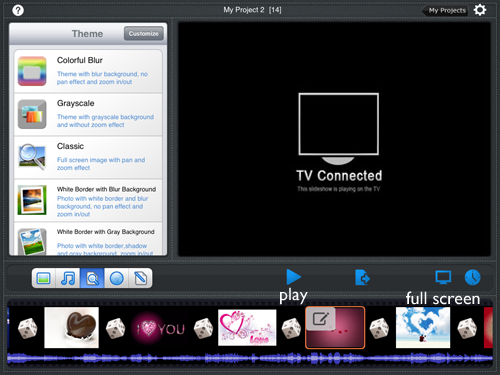 This entry was posted in Best ipad slideshow app and tagged airplay ipad slideshow on tv, create a slideshow on ipad and watch it on tv using Airplay, play ipad photos on tv in slideshow via wifi, watch ipad photos on tv wirelessly on January 22, 2013 by Sarah Jablich.